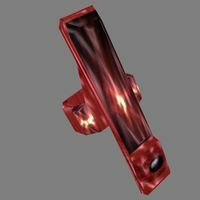 Volendrung, also known as the Hammer of Might, is an ancient artifact created by the Dwarven Rourken clan. 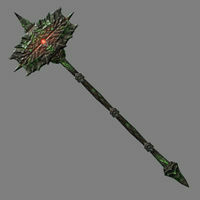 In appearance, it is a large ebony warhammer, although it may sometimes take the shape of a blade. For unknown reasons, Volendrung became a Daedric artifact of Malacath. It is enchanted with the power to paralyze foes and drain them of their strength, conferring it to the wielder. The hammer is prone to disappearing like its Dwarven creators, sometimes resurfacing in days, sometimes in eons. The hammer originally belonged to the chieftain of the Rourken clan. When his clan refused to join the other Dwemer in the First Council, the chieftain threw his hammer across Tamriel, promising to settle where ever it landed. The hammer landed in western Tamriel, and the Rourken called the land Volenfell, literally "City of the Hammer". This area later came to be called Hammerfell. The Rourken's journey across Tamriel is depicted in many of the ruins of the region, Volendrung appearing as a shining star showing the way. Sometime after the Dwemer disappeared in 1E 700, Volendrung ironically came to embody the power of Malacath, one of the Dwemer's most bitter foes. Circa 2E 582, Volendrung had seemingly been shattered into several pieces. The hammer was later uncovered during the Imperial Simulacrum by the Eternal Champion in either Morrowind or Hammerfell (reports vary). In the events leading up the Warp in the West, an agent of the Blades summoned Malacath seeking power, and a worshipper of the Prince gave the agent Volendrung in return for slaying a Daedra Seducer who had betrayed him. Volendrung later came into the possession of Divayth Fyr of Tel Fyr, Vvardenfell. He kept it in a locked chest in his Corprusarium, near Yagrum Bagarn's living area. A hobby of his was to invite thieves to steal from his chests to amuse him, as they would often fail. In 3E 427, the Nerevarine succeeded in unlocking the chest and liberating Volendrung. In 3E 433, the Champion of Cyrodiil summoned Malacath and was tasked with freeing the ogre slaves of Lord Drad from his mines. In return, Malacath gifted the Champion with Volendrung. Circa 4E 201, the Orcish settlement of Largashbur began to be openly attacked by the giants in the area. The giants had desecrated a shrine to Malacath and taken possession of Shagrol's Warhammer, a mundane hammer. Malacath cursed the tribe for its weakness, and the Orcs asked how they could obtain forgiveness. Chief Yamarz was tasked with clearing the giants from Malacath's shrine by the Prince. He was accompanied by the Last Dragonborn, but he was a weak leader and was slain when he turned on the Dragonborn. Malacath praised the Dragonborn for killing Yamarz. He then ordered the Dragonborn to return Shagrol's Hammer to Largashbur. Malacath transformed the hammer into Volendrung and gave it to the Dragonborn, while naming Gularzob as the new chief of the tribe. This page was last modified on 9 January 2019, at 03:29.